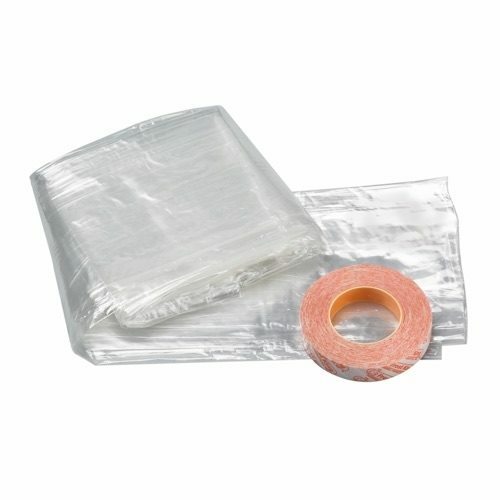 These kits come with double-face mounting tape or included nails and are specially formulated for use in the cold weather. Each kit comes with plastic sheets that can easily be stretched tight and wrinkle-free on any window. Available for standard, large, and extra large windows as well as patio doors. Q: How much money can uninsulated windows cost me? Drafts are more than just nuisances, they can be costly, between 10% and an astonishing 25% of your home's energy bill can be lost due to leaky windows. Removing the Frost King Window Kits is fairly simple. 1) Before pulling the plastic film away from your window frame, you might want to get your hair dryer (yes, the same one you used to install the window kits in the first place) and heat up the area around the double sided tape. This should soften the tape and allow you to more easily pull the tape away from your window frame. 2) Once you've softened the adhesive, pull off the plastic film. The adhesive should come right off with the film. 3) Any stubborn areas of tape that just won't come off? Use the hairdryer (again) to soften the remaining tape. Then, you can use commercial cleaning products, warm soap and water, or a mix of acetone and water to loosen the tape. 4) All that is left is to gently rub off the remaining tape with your fingertips or a soft brush. 5) If the film is still in good shape, you can always store it away for next winter. Just make sure you keep it someplace away from direct sunlight or heat, and don't forget where you pack it away. Q: Is the Crystal Clear Plastic Vinyl sheeting as clear as glass? The Crystal Clear Vinyl Sheeting is very close to glass. But it is still not quite as clear as glass. Q: How do I install the Frost King Shrink Window Kit? It's easy, take a look at this quick video from the Handy Guys. If you need some more information, take a look at our printed instructions. Q: Is the plastic from shrink window kits recyclable? Yes, all the plastic from our shrink window kits can be recycled. 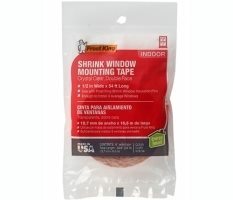 Q: How do you remove shrink film tape from around my windows? First, pull the plastic off the windows. Remove as much of the tape by hand as possible, you can gently rub the tape off with your fingertips or a soft brush. For the remaining tape just use warm soapy water. Everything you need for your Frost King Window Kits. Kits are available for basement windows, standard windows, extra large and picture windows and patio doors.